The Jagged Crown on a Draugr Scourge. Before Avingard could move, two Draugrs emerge from two crypts – one on either side of the slumped Draugr. The two Draugrs converge on Avingard, who quickly backs up and readies his sword. 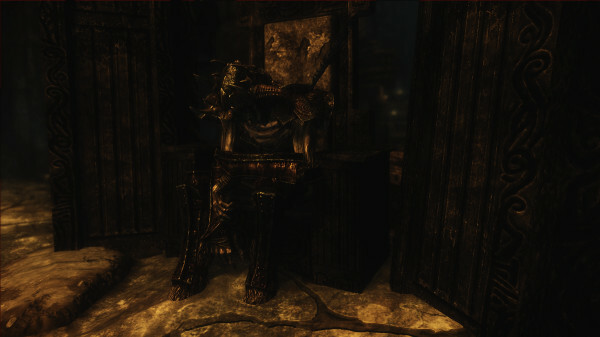 As he is about to charge one of the Draugrs, the one in the chair raises its head and then stands up. Avingard dodges the attack from the first Draugr, and then kills it with a swing of his sword. The other Draugr met its end when a Legion soldier thrusts his sword into the gut of the Draugr. The crowned Draugr, wielding a two-handed battleaxe charges at Avingard. Before the Draugr can reach Avingard, three Legion soldiers converge on it and kill it after several slashes and thrusts. The entire battle is over in a few minutes. Not wanting to make his way through the crypt, Avingard looks around for another exit. He notices a passageway behind the crypt that leads up. As he makes his way behind the crypt he starts to hear whispering voices in his head. Looking around to see if anyone else hears them and noticing the rest of the Legion soldiers just going about their business, Avingard slowly continues to walk. The whispering gets louder as he approaches the back wall of the room. Suddenly, Avingard notices blue writing appearing on the back wall, and as he approaches the writing a stream of fog appears to emanate from the writing and surrounds Avingard. Just a soon as the fog and the writing appear, the fog disappears and the whispering stops. Unsure of what just happened, Avingard slowly backs up and makes his way up the stairs. Still confused as to what just happened, Avingard makes his way down a short passage to a barred-door. He removes the wooden bar and opens the door. He finds himself back near the entrance to the temple. He makes his way to the exit. While just outside Korvanjund, Avingard notices the dead Imperial Legion soldier on the path to the temple still had his Imperial cape wrapped around him. After the numerous battles in the temple, Avingard’s cape was torn and providing little in the way of protection from the cold. He bends down and removes the cape from the dead soldier and then places his cape on the dead soldier. Feeling the cold, Avingard wraps himself in the Imperial cape and begins to make his way to Solitude. Avingard took basically the same route he took to get to Korvanjund. He made his way to Whiterun, and then took the carriage to Solitude. When he arrived in the large city, the sun was still high in the sky and the city was busy with citizens wandering about. Not wasting any time, Avingard made his way to Castle Dour and finds General Tullius sitting alone in the corner, contemplating his next move. 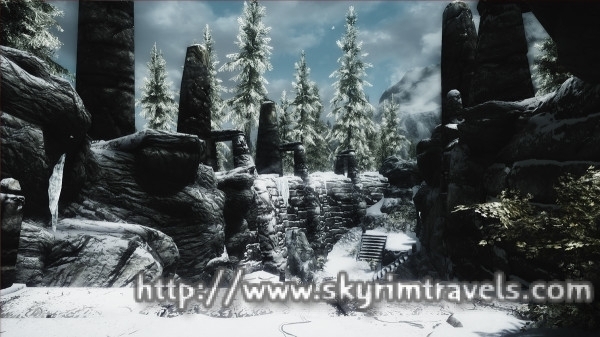 “The Stormcloaks were there ahead of us,” Avingard explained. Putting the missive away, Avingard salutes the General and then leaves Castle Dour bound for Whiterun. Loved reading these chapters so far! Are you planning on continuing Avingard’s story? I have been thinking about continuing the story, but life has gotten busy for me. I am hopeful of writing more soon.